REAL BARRIER CONTROL-T CLEANSING FOAM is a sulfate free, low pH gel type cleanser that helps protect the skin barrier while gently removing the daily build-up of excess oil. An acid balanced cleanser that when pumped onto wet hands forms a rich lather to thoroughly cleanse excess oil and impurities on the face including dead skin cells. Formulated with an anti-sebum complex of Evening Primrose Flower Extract, Kudzu Root Extract, Pine Leaf Extract, Ulmus and Clover Flower Extract all working together to help control the production of excess sebum while acting as anti-oxidants and anti-bacterial agents. Infused with a refreshing complex of Calendula, Witch Hazel Leaf Water and Tea Tree Extract to help calm irritated skin and protect against environmental stresses. HOW TO: Wet face with warm water. Pump cleanser onto wet hands and rub together to form a rich lather. Gently massage in a circular motion over the entire face. Rinse thoroughly with warm water. Pat dry. REAL BARRIER CONTROL-T TONER has a low pH and gently rids the skin of dead cells that could remain after cleansing. Helps the balance between the natural oils and water in the skin. span style="background-color: initial;">Infused with Hyaluronic Acid, which is known to attract moisture to the skin, Lactic Acid to help the skin shed dead skin cells and PCA which is a natural moisturizing agent and is also known to have anti-static properties. HOW TO: Thoroughly wet a cotton pad with toner and gently wipe over entire face in an upward and outward motion. Repeat if necessary until pad is clean. 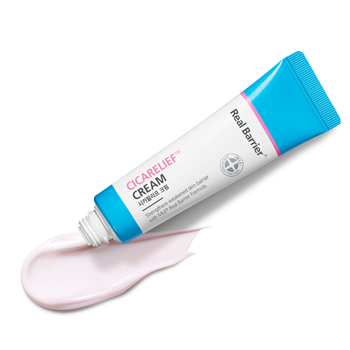 Cicarelief Cream soothes, calms and helps skin recover from blemishes… skin that has been compromised and requires “special care.” REAL BARRIER Cicarelief Cream is formulated with high concentrations of CALAMINE to help protect the skin from outside irritations, PANTHENOL to calm and MADECASSOSIDE to soothe. HOW TO: Use AM or PM after cleansing. Pat dry. Gently apply to blemishes/breakout areas until completely absorbed. Apply a thick layer to areas that need extra attention. REAL BARRIER CONTROL-T MOISTURIZER is a non-sticky, lightweight moisture replenishing emulsion that helps balance oil and water all day. This milky moisturizer is quickly absorbed and leaves skin feeling non-greasy and hydrated. HOW TO: Pump moisturizer onto fingertips and gently smooth over face and neck in an upward motion until moisturizer is completely absorbed. The Real Barrier Control T products were developed for those with oily and/or acne prone skin. This unique mask is the ultimate 2 Step spot solution for sensitive and blemished skin. HOW TO: STEP 1, a fabric sheet, full face mask of plant origin made with Sarcandra Herb (this is the cause of the yellowish tint to the fabric). This sheet is then saturated with a calming essence of Tea Tree Oil. STEP 2 contains patches formulated with a patented Natural Protector (KR Patent No. 10-0910747) which is a complex of natural extracts including Salix Alba (willow) Bark Extract, Origanum Vulgare Extract, Chamaecyparis Obtusa Leaf Extract, Portulaca Oleracea Extract, Lactobacillus/ Soybean Ferment Extract, Cinnamomum Cassia Bark Extract and Scutellaria Balcalensis Root Extract. All of these specialty ingredients work together to help promote skin protection and the calming of irritations caused by the stresses of the environment..